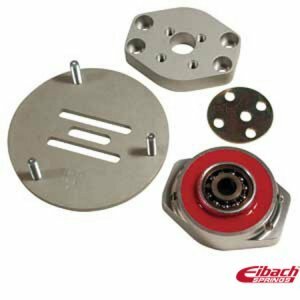 Eibach Pro Alignment Kit: After the installation of either an Eibach Pro-Kit, Sportline spring kit or Pro-Street coil-over kit, a vehicle's alignment should always be checked. Once a vehicle is lowered, wheel camber may become excessively negative, meaning the top of the tire is angled inward (toward the center of the vehicle). While some negative camber aids in improving traction and road adhesion, too much can result in compromised handling and accelerated tire wear. For the extreme lowering of Sportline and Pro-Street applications, look for the alignment kits with a greater range of alignment necessary to accommodate the extreme lowering. These will be listed below the standard Pro-Alignment kit in the applications section.